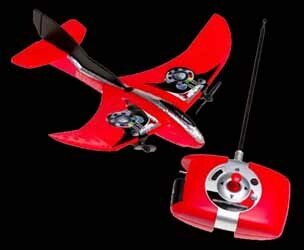 I've come to regard the arrival of a new Air Hogs remote control aircraft in the office with a mixed feeling. On the one hand I'm as excited as a small school boy, looking to see how they've managed to top what has gone before. And on the other hand I dread being told that "No! It's not your turn to review this one Ray!" So I was over the moon to hear that I was to be given a day pass to leave the Totnes office and wander aimlessly on Dartmoor to try out the latest Defender R/C plane. It's easy to set up - no fiddly construction to undertake - and all you have to do is charge it for a couple of minutes and you can fly for around five minutes. The controller also acts as the charger, which is well thought out, and takes 6 x AA batteries. The plane is constructed from high-density EPP foam (which is stronger than EPS or polystyrene, but is still incredibly light) and has a range of up to 300 feet. The only slight complaint I had, and this is something that I've noticed with a lot of the Air Hogs models, is that the image on the box is much more polished than the finished item. This plane had rough edges, making it look a little unfinished and as though it might break apart when I picked it up. Of course, it didn't, but it would have been nice if it had been finished a little better. Also you have to be very careful when picking this up. The wings can be easily damaged if you don't treat this craft with delicate hands. 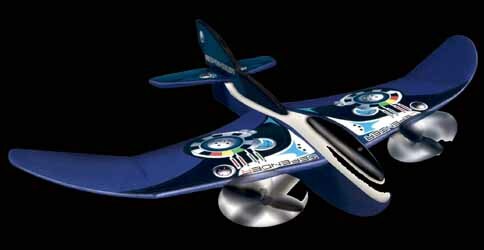 An extra bonus is that those lovely Air Hogs people have also included a spare set of propellors to ensure that you get hours of fun out of this entry level introduction to the world of R/C planes. And, quite frankly, it's a bargain at £30.